They received 21% of the vote with 99% of votes counted. Other Basic Income-supporting parties, the Green League and the Left Alliance were on 8% and 7% respectively. This is a big gain for both the Centre Party and the Green League but is a reduction in support for the Left Alliance. The second and third biggest parties respectively were the conservative NCP party and the populist True Finns. As a result, the Centre Party is predicted to form a ruling coalition with these two parties. While the Centre Party has come out in support of Basic Income, it is not certain where these other two parties lie on the issue and whether we would see some movement on Basic Income with these parties in government. The leader of the NCP and former prime minister, Alexander Stubb has expressed his support for Basic Income in parliament, however, the policy is not mentioned in his party’s manifesto. The True Finns have made no statements about the policy. In a recent poll of candidates for the election by state news organisation YLE, 57% of NCP candidates were opposed to Basic Income while 87% of Centre Party respondents and 57% of True Finns respondents were in favour. Though this coalition is more likely, a centre-left coalition with the Social Democratic Party (16.5%), the Greens and the Left Alliance is also a possibility. The Greens and Left Alliance already favour Basic Income and while it is not part of the SDP’s platform, 53% of their candidates are in favour according to the above-mentioned poll. A public opinion poll on the issue earlier this year by a think tank associated with the Centre Party showed 79% of the public in favour of Basic Income. Creator of the Basic Income Now activist website, moderator of the reddit /r/basicincome community and active member of Basic Income Ireland. The political plan for the next Finnish governement was published may 27th and it includes a pilot in basic income. 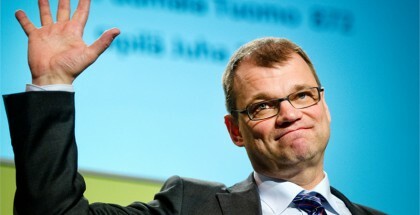 Juha Sipila and the Centre Party succeeded to get the pilot in the programme. I´m looking forward to see the pilot in action.